Hello everyone ,Cheryl here with another Halloween card made using the CottagCutz Hocus Pocus Release from The Scrapping Cottage. I used the CottageCutz "Classic Witch" and colored her with copic markers. She is easy to put together, and then I decided to use the frog on jar of eyeballs, he is too cute!!! 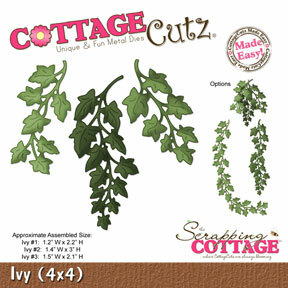 For the greenery I used the CottageCutz Ivy that came out in the CottageCutz "Victorian Garden" Release. I colored them with copics as well. 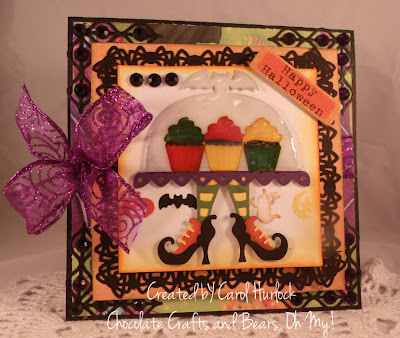 I framed the one layer with the CottageCutz "Spiderweb Border" , and then stamped a Happy Halloween from Victorine Originals. Added a bow and some webbing from RRR!! 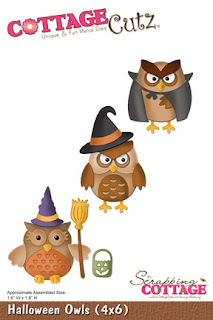 Thank you all for looking and have a Happy Halloween to all!!! CottageCutz Design Team Call can be found HERE! Good morning! 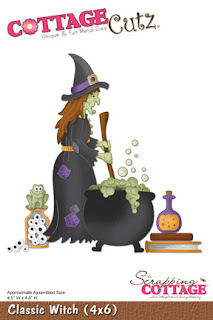 Happy Sunday to you, and welcome to The Scrapping Cottage Blog! 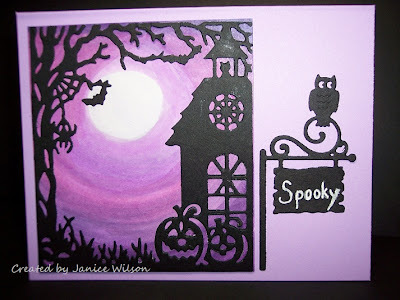 It's Lorie here from The ThINKin' Spot today to share another Halloween card with you. 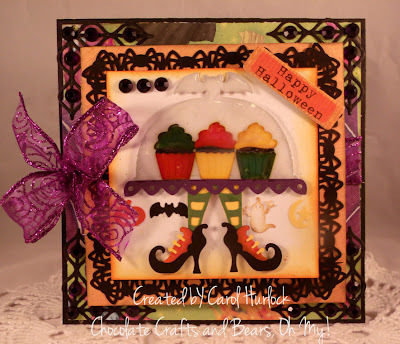 As the time for ghosts and goblins draws near, it's fun to play with CottageCutz dies, creating cute cards and projects to share with all the spooky and cute Halloween visitors. This card was created using the CottageCutz Potions Table 4x6 die. I cut these pieces using colored card stock and sponged the edges using distress ink to define the edges and give some vintage style shading. I arranged the pieces a bit differently than pictured below, and there are still so many more ways you could arrange the scene or create new scenes with the variety of pieces that are a part of this die. Awesome possibilities for being creative!! 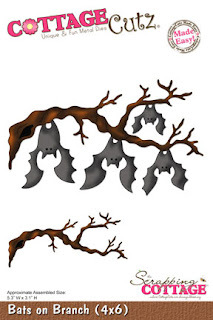 I left the sentiment out for now, but a simple Happy Halloween, or "Welcome To My Lair" would be great choices for this card. Here's a look at the complete die and if you click on it, it will direct you right to The Scrapping Cottage Store, where you will find it, along with so many wonderful dies. 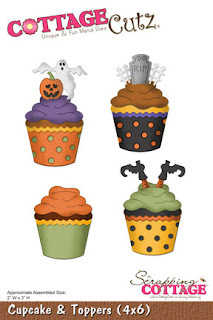 Don't forget to check out our newest releases for harvest and Christmas seasons! They are stunning!! So glad you could visit today! Thanks for sharing part of your day with us! Have a glorious day filled with blessings and LOTS of happy crafting! Hello everyone its that time of year when we are looking for full time designer(6 month term) and Guest designers to design with the CottageCutz design team. Please see below this post for our Normal Daily Posts, Thank you! Post to the CottageCutz blog and your personal blog 3 times a month using only CottageCutz dies, not other dies are permitted. 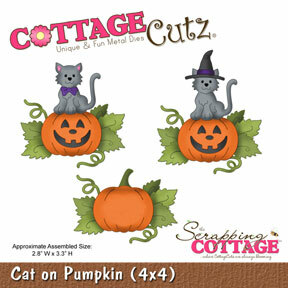 Please be sure to list all CottageCutz dies and appropriate links back to the store. Team spirit and to follow directions accordingly. If published in printed magazine, you will receive a store credit to CottageCutz and our name “CottageCutz” must be listed in the Supply list for your project. ***This Design Team call is open to everyone, and you have until November 18th at 12 Midnight Eastern time. Thank you to all that apply!! Hello everyone! I am back with the card I said I would share with you using the CottageCutz Frankly die. I made this background before I realized what a great cloud the hole in the ground negative would make. For these clouds I tore a strip of paper about 3 inches long making a rough edge. I then sponged Memento grey flannel to create the wispy clouds. 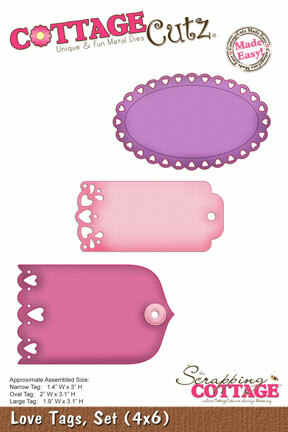 The negative stencil is much easier to use, and I plan on using it more often. 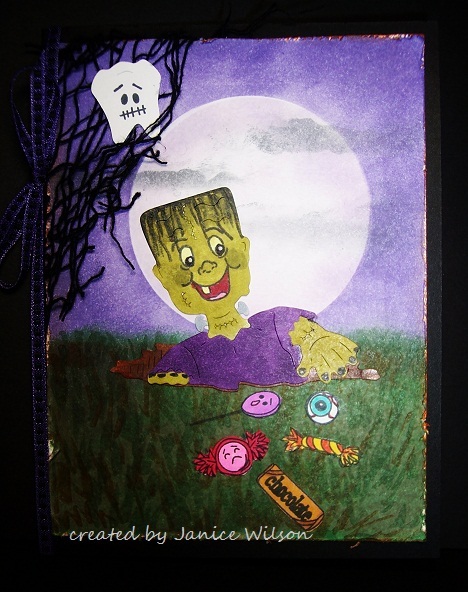 I used CottageCutz Halloween Scene for my second card. 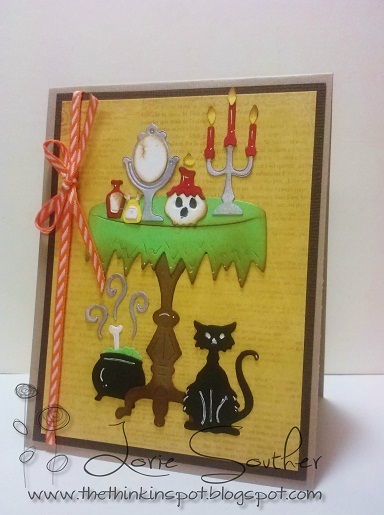 The background is from a card that I made awhile back on my blog. I didn't like the way it was turning out, so I started over. I didn't throw it away because I thought I might find some use for it. It was perfect for this little Halloween Scene. Hope you like it! Hello everyone, and Happy Friday to all!! 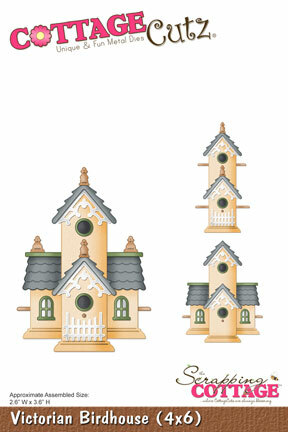 Today's card showcases the SUPER DARLING CottageCutz "Victorian Birdhouse"
I dusted the house with Tim Holtz inks, and then put it together. I used LOTS of Really Reasonable Ribbon on my card today. I also added sewing to each layer including the circles. I LOVE this darling lil' CottageCutz Victorian Birdhouse, its sooo sweet!!! there are lots of other beautiful cottagecutz dies from this collection as well, you can find the Victorian Collection Here! Hello everyone, today I'm sharing a Darling CottageCutz Halloween Hocus Pocus Mini Toilet Paper Album. I really enjoyed putting this mini together. I used 4 Toilet Paper Rolls, and covered them with paint,DCWV design paper, Lots of Really Reasonable Ribbon,Lace and Trim. I also added some feathers, and buttons. On these 2 pages, I used CottageCutz "Bats on Branch" and the Ghost from "Cupcake Toppers". They are colored with Creative Inspiration Paints in Onyx,Chocolate, and blue ice for the ghost. on these 2 pages I left them pretty plain, but did add 2 spiders from the CottageCutz "Spiderweb Border" they are colored too with Onyx. I also colored my flower and added a cat face to it. 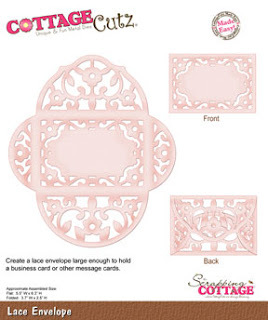 For my last page here I used the Beautiful CottageCutz "Lace Envelope" LOVE using this in all my mini's, its perfect for the back page and adding either a spot for writing,pictures or just tags. All the dies are linked above, but wanted to share photo's of all the ones I used. Thank you for looking and have a lovely day!!! Isn't this just darling. 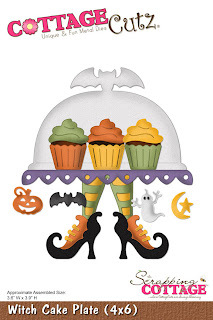 It's CottageCutz time and Carol here today showing you this die called Witch Cake Plate. 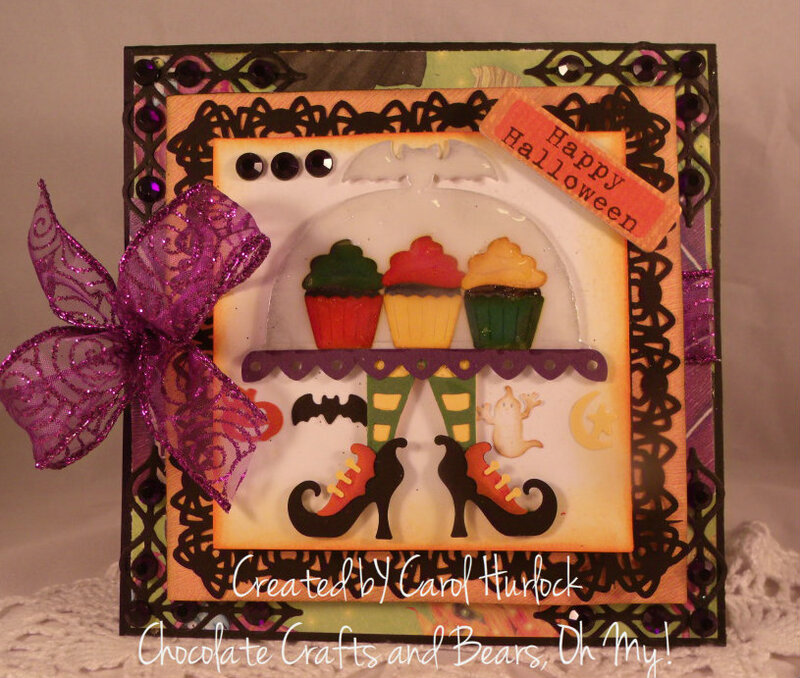 I am just tickled with this die and thinking next year I will use this die and host another Halloween Tea Party. This would be a perfect image for an invitation to a Spooktacular party. I cut out all the pieces from the die and distressed them with Brushed Corduroy distress ink and assemble the pieces. I applied glossy accents to the "cover" to make it look like glass. Martha Stewart Spider Punch around the page was used to accent the focal point and I used spellbinders for the corners and applied purple rhinestones in the centers.